This housing project on the rim of Lelystad is divided between three small blocks of terraced housing along the access road and, beyond these, an area of semi-detached rural-style villas. Those terraced houses and pairs of villas along the edges are more urban, being of brick with tiled roofs. The villas in the central area take their cue from Amsterdam School houses in Park Meerwijk in Bergen and Gerrit Rietveld's timber summer house in Breukelen. 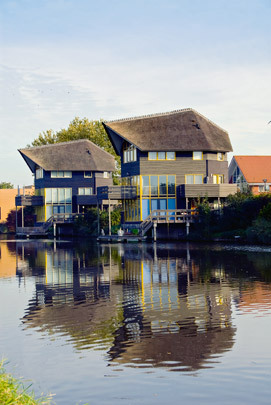 These spacious houses have prominent thatched roofs, sun rooms and landing stages if sited along the water. The centrally sited villas are white rendered, whereas those along the water have walls of horizontal planks.